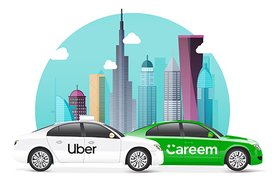 SAN FRANCISCO/DUBAI -- Uber Technologies Inc will spend $3.1 billion to acquire Middle East rival Careem, buying dominance in a competitive region ahead of a hotly anticipated initial public offering. Uber said late on Monday night it would pay $1.4 billion in cash and $1.7 billion in convertible notes in a deal that gives it full ownership of Careem, which operates in more than 90 cities in the Middle East and Northern Africa. The long-expected agreement ends more than nine months of start-and-stop negotiations between the two companies and hands Uber a much-needed victory after a series of overseas divestments. Careem had raised less than $800 million from investors and as of October had a $2 billion valuation. Its backers include Daimler AG, Chinese ride-hailing company Didi Chuxing, Japanese Internet company Rakuten Inc. and Saudi investor Kingdom Holding Company. The deal is expected to close in the first quarter of 2020, the companies said, meaning it will not be reflected in Uber's first couple of quarterly earnings releases as a public company, although it will likely be disclosed in an IPO filing. Uber will kick off its IPO next month and is expected to receive a valuation of at least $100 billion. Uber has been eager to reach an agreement before the company begins its road show, when it will meet with public market investors prior to listing shares on the New York Stock Exchange. The deal enables Uber to claim dominance in a growing region for ride-hailing outside of the United States. The merger follows the $580 million acquisition of Dubai-based ecommerce company Souq Group by Amazon.com Inc in 2017, according to a U.S. Securities and Exchange Commission filing, spotlighting the Middle East's budding technology scene. Kingdom Holding said it was selling its stake for $333 million while Saudi Telecom, which invested indirectly through its venture funds, said it will receive $274 million in cash and convertible notes.